Angels work as God’s messengers to people, communicating in a variety of ways, including speaking, writing, praying, telepathy, and music. What are angel languages? People may understand them in the form of various communication styles, and sometimes report receiving written messages from angels. Angels write for a variety of reasons, but all of those reasons are steeped in the love they have for God and human beings. While communicating their messages to people, angels may use different types of writing. Some people believe that angels may prefer to communicate with humans in writing via a special alphabet known as the Angelic Alphabet or the Celestial Alphabet. That alphabet was developed during the 16th century by Heinrich Cornelius Agrippa, who used both the Hebrew and Greek alphabets to create it. The letters of the alphabet correspond to constellations of stars in the night sky. In the mystical branch of Judaism known as Kabbalah, each Hebrew letter is a living angel that expresses God’s voice in written form, and the shapes of the stars form shapes that represent those letters. Agrippa said of those who practiced Kabbalah: "There is also amongst them writing which they call Celestial because they show it placed and figured amongst the stars, no otherwise than the other astrologers produce images of signs from the lineaments of stars." Later, the letters in the Angelic or Celestial Alphabet took on occult meanings, with each letter representing a different spiritual characteristic. People would use the alphabet to write spells to ask angels to do something for them. Angels sometimes write the histories of human attitudes and behaviors, according to religious texts. The Quran says in chapter 82 (Al Infitar), verses 10-12: “But verily over you are appointed angels to protect you, kind and honorable, writing down your deeds: They know (and understand) all that you do.” These two angels are known as the Kiraman Katibin (honorable recorders). They pay attention to everything that people past puberty think, say, and do. The angel who sits on the right shoulder records good choices, while the angel who sits on the left records bad decisions, says the Quran in chapter 50 (Qaf), verses 17-18. If people make more good choices than bad, they go to heaven. If they make more bad decisions than good and don’t repent, they go to hell. In Judaism, the archangel Metatron writes down the good deeds people do on Earth, as well as what happens in heaven, in the Book of Life. The Talmud mentions in Hagiga 15a that God allowed Metatron to sit down in his presence because Metatron is constantly writing: "Metatron, to whom was given permission to sit down and write the merits of Israel." This is unusual because others stood up in God’s presence to express their reverence for him. Some people practice automatic writing with angels, which involves channeling an angel. This is an invitation to angels to work through a human body to write their messages. After asking a question through prayer or meditation, people begin to write whatever thoughts enter their minds without consciously thinking about what they are writing. Later, when they read those written messages, they try to figure out what the words mean. The expression “the writing is on the wall” came from Daniel chapter 5 in the Torah and the Bible. The phrase refers to a memorable incident from when King Belshazzar was giving a party in Babylon. His guests were using golden goblets that his late father, King Nebuchadnezzar, had stolen from a temple in Jerusalem. 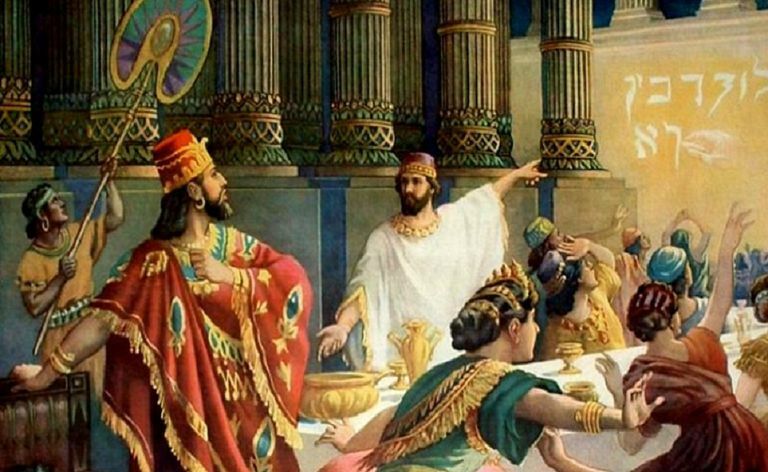 Rather than using the goblets as they were meant to be used (as God’s holy vessels), King Belshazzar was using them to flaunt his own power. “Suddenly the fingers of a human hand appeared and wrote on the plaster of the wall, near the lampstand in the royal palace. The king watched the hand as it wrote. His face turned pale and he was so frightened that his legs became weak and his knees were knocking” (Daniel 5:5-6). Many scholars think that the hand belonged to an angel, who did the writing. The terrified guests left, and King Belshazzar called magicians and sorcerers to try to translate the written message, but they couldn’t explain what it meant. Someone suggested the king call for the prophet Daniel, who had successfully interpreted dreams before. Daniel told King Belshazzar that God was angry with him because of his pride and arrogance: “You have set yourself up against the Lord of heaven. You had the goblets from his temple brought to you, and you and your nobles, your wives, and your concubines drank wine from them. You praised the gods of silver and gold, of bronze, iron, wood, and stone, which cannot see or hear or understand. But you did not honor the God who holds in his hand your life and all your ways. Therefore, he sent the hand that wrote the inscription” (Daniel 5:23-24). “This is the inscription that was written: ‘MENE, MENE, TEKEL, PARSIN.’ Here is what these words mean: Mene: God has numbered the days of your reign and brought it to an end. Tekel: You have been weighed on the scales and found wanting. Parsin: Your kingdom is divided and given to the Medes and Persians” (Daniel 5:25-28). That very night, King Belshazzar died, and his kingdom was divided and given away just as the writing had foretold. Agrippa, Henry Cornelius, et al. "Three Books of Occult Philosophy." Paperback, 1 ed edition, Llewellyn Publications, January 8, 1992. Wagner, Walter H. "Opening the Qur'an: Introducing Islam's Holy Book." 1st Edition, University of Notre Dame Press, March 15, 2016. Boshoff, Pastor Rudolph. "Divine prefigurements in the early Jewish understanding of Yahweh." Ad Lucem, January 20, 2016. Various. "Daniel 5." Holy Bible, NIV, Massachusetts Institute of Technology, Cambridge, MA.